Ken Ham’s Answers in Genesis (AiG) is symptomatic of an addiction wreaking havoc in Protestantism, and particularly in Southern Evangelicalism. Ken Ham is just one leader of the many cults of convenient answers that seeks to maintain its relevancy by supplying dogmatic answers to each and every question available. Modern evangelicals and Christians in general seem to be obsessed with having cute answers to every question available (See Ligonier Ministry’s “Table Talk” issue “Giving an Answer”). Maybe it has to do with the anti-worldliness-defense, culture-war-waging, or atheist-evangelizing training exercise mentalities, but there is nonetheless far too much of a focus on always having an answer, regardless of whether or not it is right or even remotely grounded in reality. Dr. Peter Enns writes about such cultish mentalities in his recent book “The Sin of Certainty” which goes through the development of this mentality and diagnoses it and its many symptoms for what it really is: a lack of faith in God. 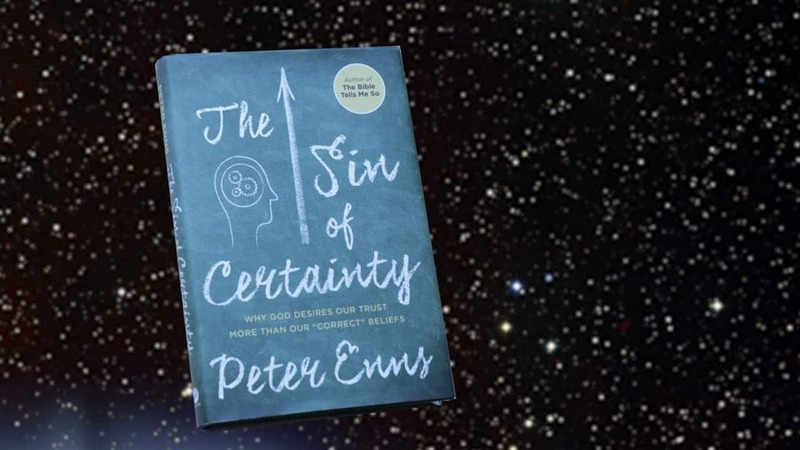 The sin of certainty, Enns argues, is not having faith (placing one’s life and trust) in God but rather relying on one’s own understanding and ability to be right all the time. This obviously causes huge problems when issues of biblical interpretation or cultural context arise. The religiously motivated culture wars and most anti-scientific sentiment can be traced back to an unwillingness to think deeply about tough issues, sacrificing a relationship and trust in God for a mere bulleted list of supposed facts and self-evident truths whose presumed truth is the very bed-rock of self-esteem, morality and even existence. Why are so many people so upset about evolution or the ideas of social welfare or climate change? They don’t fit in with their preconceived ideas and haven’t yet percolated into the dogma guarding “intelligentsia” of their preferred cult. Interestingly enough though these cults often do change their ideas to make them more palatable. For instance, Ken Ham has done a 180 degree turn on the idea of evolution. Ken Ham and AiG now claim that not only does evolution (the changing of one species into another) happen, but that it actually happens far more rapidly than any self-respecting scientist has ever proposed. AiG has made this policy change because they realized that there was no way to fit the millions of animal species into Noah’s Ark, but also that there simply isn’t enough time from 6000 years ago for there to be regular micro-evolutionary changes from a small set to what we see today. Therefore they have recently adopted the view that all life we see now in its myriad of diversity originated in a small subset of a few thousand species kept in the Ark (pictured) just a few thousand years ago. They traded one ridiculous idea (no speciation ever occurs) for an even crazier one (speciation happens millions of times more rapidly). This is just one example of the hypocrisy inherent in Answer Cults, and I could go on, but the point Pete Enns tries to make is not that being in an Answer Cult is somehow wrong or bad for science, but that the entire underlying motive is sinful. Placing our hope in salvation in being right and having correct beliefs is contradictory to Christ’s offer of salvation through faith in Him. The world is far more complicated than we can understand, and God infinitely more so. Assuming that we can slap a convenient description and answer to life’s big questions is insulting to that majesty and power, whether it be from God-condemning atheist or God-defending fundamentalist. Personally I have given up on trying to answer such questions. Whenever a fundamentalist friend asks me how I as a scientist can rectify the spiritual world with the naturalistic world I study empirically I just say that I don’t know and that I probably will not be able to any time soon and that I typically just assume Occam’s razor for most things. Whenever an atheist or agnostic friend asks me how I can rectify the evils of organized religion or the lack of empirical evidence for the core truths of Christianity I don’t try to smack them with Bible verses or anecdotal evidence and I typically agree with them that it is all strange and just appeal to the vastness and unknowability of reality, and sometimes invoke the historical personhood of Christ as a starting point at least. It is not very comforting, and it keeps me up at night pretty often, but it is far more comfortable than doing mental gymnastics at every turn to merely conform to some popular dogmatism. On October 6th I will be joining The Liturgists in Boston for a Liturgists Gathering where a group of like-minded people join together to sing and talk about God without the labels and dogmatic creeds that are seemingly inescapable in other religious atmospheres. I will be sure to write about my time there, but in the mean time you can listen to their podcast here. As someone who disagrees strongly with much of this, I do genuinely thank you for these posts. I’m currently reading Cornelius Van Til’s “A Survey of Christian Epistemology,” and I’ve got his “A Christian Theory of Knowledge” to follow with (after “The Pilgrim’s Progress,” which I’ve been putting of for far too long). Your arguments definitely give me things to think about as I read these.